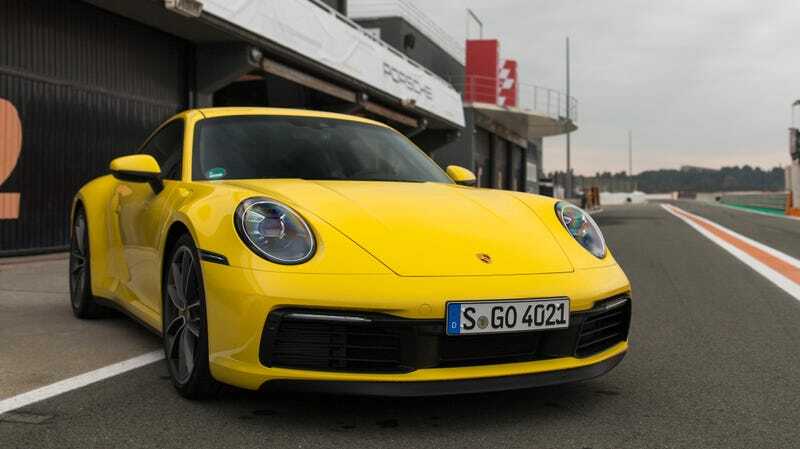 The most-asked question I got about the new 2020 Porsche 911 was how it’s different from the outgoing 991.2-generation car. Because it sure looks the same, except for a few aesthetic cues. I spent a decent chunk of time poking around it last week. To help you out, here are photos of the two generations of cars back-to-back for reference. Got it? OK, good. Onward! Obviously, from the outside, there are a few key changes between the 992 and the 991.1 and 991.2 generation. The 992’s front bumper has a much larger expanse of black grille detailing. The thin blades that extended downward on either side of the license plate cover are no longer painted in the body color. The result is a much more gaping mouth. The hood lines are also much sharper and more geometric. Side indicators now ride above the front bumper line and have been lengthened slightly. And the car also comes exclusively with LED headlights now. Door handles are flush against the body and are only slightly annoying to use. Most dramatically, however, is the addition of a single, horizontal light blade in the rear and a new vertical center brake light. I like the new brake light. I like the 90-degree contrast it makes with the rest of the rear, which is comprised of a series of lengthy, sideways slashes. Unfortunately, I think that’s where my goodwill towards the rear ends. The new design doesn’t flow very well. There’s a lot of empty space and there’s also a lot of contrasting black venting, too. It’s almost like there are just a few too many flat and tall planes of nothingness. The lettering that spells out “Porsche” has also been set slightly into the body, which is neat. I am having mild nightmares when I imagine trying to buff and wax in those little spaces, however. Font used on the rear trunk lid is a modern and vintage combination. “Carrera” is scrawled in the contemporary font, while “911” is slightly offset and written in the blockier, ’60s-era font that’s found on the very first Porsche 911. Another first for the Carrera are staggered wheel sizes: 19 inches in the front and 20 in the back on the standard car, 20 inches in the front and 21 inches in the back for the S models. This supposedly is to help improve grip and handling without making the tires too wide for fear of worsened hydroplaning. Plus, there are new wheel designs from the 992. The new 911 also has more driver assistance features than ever, including an infrared night vision sensor, a 360-degree bird’s-eye camera and a Wet Mode. This is a safety system that monitors the slickness of the road and affects the traction control accordingly. Physically putting the car into Wet Mode almost guarantees you won’t oversteer when you’re driving. There’s also an on-board ionizer, another new feature, that will undoubtedly help you drive your 911 safely through the inevitable nuclear winter. Also touched upon in our first drive is the new, eight-speed PDK, which we learned has been packaged with enough spare room for a potential hybrid system, if Porsche ever wanted to head in that direction. This new transmission now adds about 44 pounds to the overall weight of the car. Then there’s the all-aluminum body, another first for a Carrera. Porsche cut down dramatically on the use of steel, which the automaker says helps save the car about 26.5 pounds. The engine has been updated with larger-diameter turbocharges and an electronic wastegate, thus improving the efficiency and cold-start functions. The engineers have also transitioned from using solenoid injectors to piezo injectors. The intercooler has also been moved up higher on the engine. The engine mounts, too, have been moved up further, making them closer to the longitudinal beams for more stiffness and reduction of engine movement. At the same time, the new Carrera apparently has vastly improved NVH qualities. I did notice that it rode a lot more quietly on the highway than the previous generation did. On the inside, the design has shifted from the vertical-heavy layout that 911s took on during the 996 generation to a more ’60s-style horizontal layout. A slim shelf-line does wonders for splitting the dash into a “top” and “bottom” section. Gone are the T-rex-arm cupholders; they have been replaced with ones that look like real cupholders. And there’s a slot in the center console that can be fitted with an additional cupholder. Mercifully, the center console gets rid of with the chunky, button-heavy layout that plagued the last generation of 911s. The result is a clean, empty and minimalist design. Two of the five tactile switches located below the infotainment screen can be programmed for specific settings. Most of the iconic five-gauge cluster is now digital, save for the middle gauge, which remains analog. I wasn’t too pleased about this. I like physical gauges and these digital ones don’t do it for me. But this does mean that you can alter what each gauge shows. The gear selector is the smallest it’s ever been, about the size of a big flash drive. It’s unobtrusive and adds to the overall minimalism of the cabin, but it also doesn’t really look much like a gear selector anymore, either. And, sadly, the 992 911 finally does away with the key fob, replacing it with a proximity key, just like the rest of the cars out there. Yet, in lieu of a start button, there’s a switch built into the left-hand side, which you turn like you would a normal fob or key to start the car up. I think I prefer this to a start button. All in all, the 992 will not be spared from jokes about how it looks the same as the last 911. And the next one will probably look just as similar. But I guess that’s how evolution works: It’s a series of small changes that happen over the course of multiple generations. Because when you line the first 911 up with the latest one—that’s when the differences are stark.